Spanish poet of the fifteenth century; born in Montoro 1404; died after March, 1477; son of Fernando Alfonso de Baena Ventura, and a near relative of the poet Juan Alfonso de Baena. His vocation was that of a "ropero"; he calls himself "el Ropero" or "Aljabibe," both signifying a dealer in old clothes. When advanced in years he was baptized, but despite his baptism he remained a Jew at heart throughout his life; and in a poem to a magistrate in Cordova, his place of residence, he laments that, driven by hunger, he had had to break the oath of his ancestors and buy pork, as he found no other meat in the butcher's shop. Even in his old age he took a lively interest in his persecuted coreligionists. Thus he addressed a pathetic complaint to King Henry IV. in reference to the plundering of the houses of the Maranos of Carmona in 1474. Anton de Montoro, who was welcomed by the noblest families of Cordova, and whose verse was valued highly by some of the best poets of his time, as by the Marquis de Santillana, Juan de Mena, etc., was treated with contumely by poets of his own race. At sixty-five he wrote a poem to Queen Isabella in which he complains that he is still treated as a Jew and called "the old, contemptible Jew." Commendador Roman, who posed as a pious Christian, taunted Montoro with the fact that his father had been a ḥazzan; Juan de Valladolid, Rodrigo Cota, and others scorned him because of his former faith. He was in high favor with D. Pedro de Aguilar and with his son D. Alonso Fernandez de Aguilar, the noble protector of the Maranos, whom he celebrated in several poems. After the persecution of the Maranos in March, 1473, Anton de Montoro, who was also made to suffer under this calamity, found protection and refuge with D. Alonso de Aguilar. He settled in Seville, but soon returned to Cordova, where, old and weak, he made his will March, 1477, and soon afterward died. His poems were collected by Emil Cotarelo y Mori, and published with an excellent introduction and valuable notes under the title "Cancionero de Anton de Montoro" (Madrid, 1900). 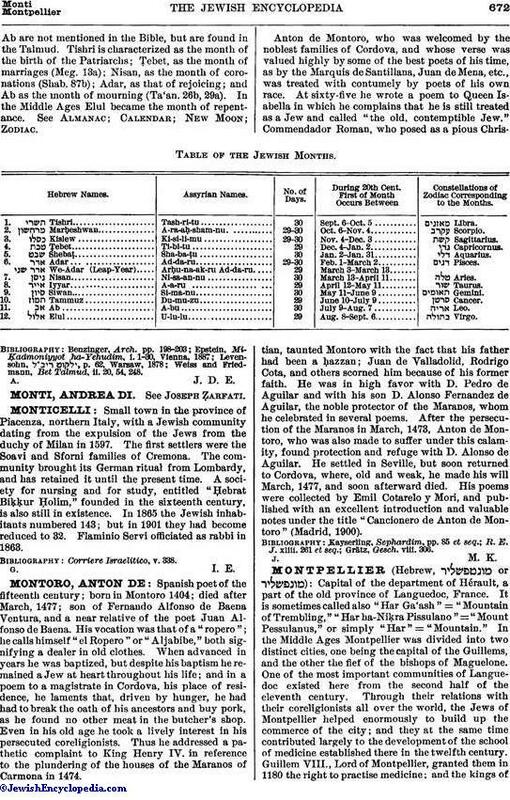 Table of the Jewish Months. Constellations of Zodiac Corresponding to the Months. 1. Tishri Tash-ri-tu 30 Sept. 6-Oct. 5 Libra. 2. Marḥeshwan A-ra-aḥ-sham-nu 29-30 Oct. 6-Nov. 4 Scorpio. 3. Kislew Ki-si-li-mu 29-30 Nov. 4-Dec. 3 Sagittarius. 4. Ṭebet Ti-bi-tu 29 Dec. 4-Jan. 2 Capricornus. 5. Shebaṭ Sha-ba-ṭu 30 Jan. 2-Jan. 31 Aquarius. 6. Adar Ad-da-ru 29-30 Feb. 1-March 2 Pisces. 7. Nisan Ni-sa-an-nu 30 March 13-April 11 Aries. 8. Iyyar A-a-ru 29 April 12-May 11 Taurus. 9. Siwan Si-ma-nu 30 May 11-June 9 Gemini. 10. Tammuz Du-mu-zu 29 June 10-July 9 Cancer. 11. Ab A-bu 30 July 9-Aug. 7 Leo. 12. Elul U-Iu-lu 29 Aug. 8-Sept. 6 Virgo.